The sun was bright in the sky. The water was aqua blue with white caps breaking on the beach. The temperature was cool and, best of all, there was wind. It was a weekly kite club fly day and we could fly. Yippeee! I will say flying wasn’t easy. The weatherman lied a little. He forecasted wind in the 10 to 15 mile per hour range. Perfect wind. In reality, it was about 12 one minute and 3 to 4 the next. So we spent a lot of time picking up the kites that drifted to the ground and putting them back up in the sky. But that was all right. We had the chance to get together with friends and share the day. 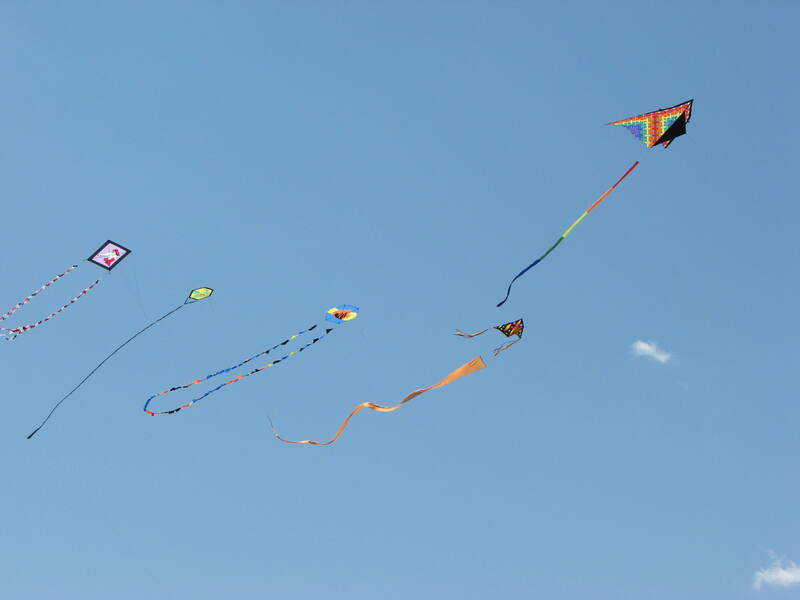 There were several fliers that were down on vacation and we caught up on news and made plans for the upcoming Carolina Kite Festival. The sky above looked like a small kite festival. That’s the way we like to see it. And we like to see others enjoying the sight, too. Another reason I was so glad to have a good flying day was that I had two new kites to put in the air. 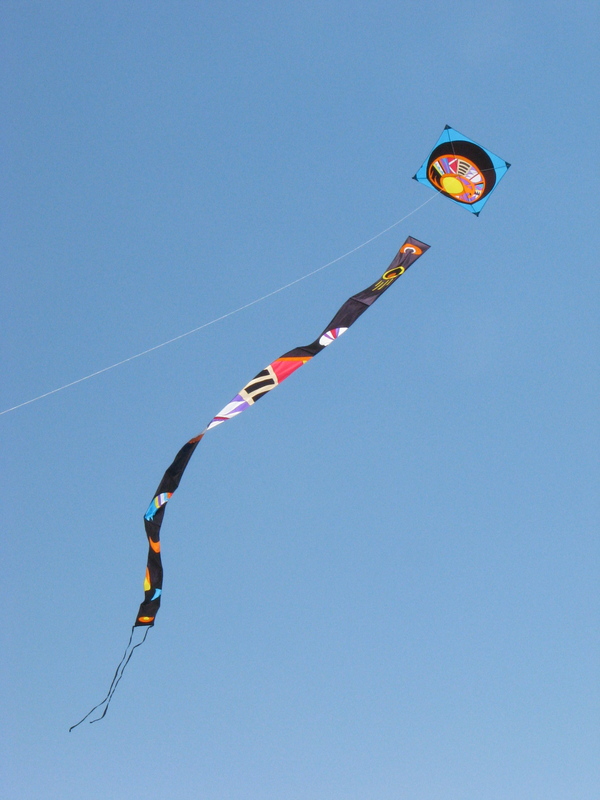 One was a large dragon-type kite by Premier Kites called Blackfoot’s Magic Gourd. I’ve been eyeing this kite for a long time. And kept talking myself out of buyng it. Well, that only works for so long. It’s mine now. And it really puts a show on when it’s in the sky. The other kite was a custom kite by Ray Wong. It is a rokkaku called “Windows”. Mine is the pink version. The owner of the kite shop has the blue version. In fact, it was the blue version that I saw initially. 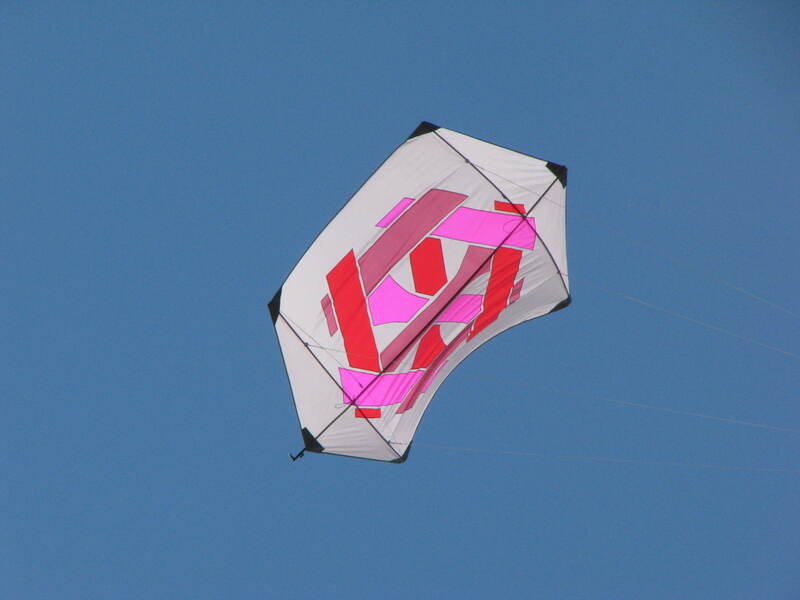 I saw the pink version in the kite shop when looking at the kites in the special kite bin. Special because they were hand-made custom kites. I also saw this one in the sky at one of the kite festivals. This past month was our wedding anniversary and my husband bought me this kite as a present. Seems that is what we do for special occasions, trade kites as presents. So I finally got to fly it. And it went straight up. I was rather surprised at the angle of its flight. It was directly above our heads. In fact, a couple of times I thought it was lost because I didn’t look high enough in the sky when checking on it. As I mentioned before, the plans and preparation for the Carolina Kite Festival are moving ahead. Although it often seems like we take one step forward and two steps backward. So many changes this year. Some of our invited guest fliers can’t make it. That’s really sad because we look forward to visiting with them and watching them fly. I guess the local fliers are going to have to take up the slack and provide some entertaining flying (or crashing as the case may be). Hopefully, most of the viewing public will be in so much awe of the wonderful kites, they won’t notice the flying miscues. Guess that’s all for now. I’m going to try to get some extra flying time this week. The dust on the coffee tables will still be there when I get back.